Location. Malye Shory, Lebyazhskiy area. A local resident of this village on the banks of the River Vyatka woke up one sultry night to drink some water. The window of the kitchen was opened and after satisfying her thirst she saw someone walking beyond the window near the wall of the kitchen. The night was light and there had been a slight rain and under the moonlight she could see a tall thin “man” wearing a shiny tight-fitting rubber suit dark in color. The suit covered all the man’s body and his head except for his face and hands. His face appeared quite common, generally human, with white skin. Something resembling a hood covered his head. The witness noticed the disproportional length of the humanoid’s hands. The man stood on the flowerbed prodding the earth with something resembling a syringe, about a 1 meter in length and about 15-20cm in diameter. The woman immediately thought that the stranger was a “typical alien” and dared to step out of her house. The stranger immediately stopped what he was doing and moved away from the flowerbed. The woman then asked, “Why do you to come here? Why do you worry us? The alien answered, “We brought you a contagion. But you die slowly. So now we brought you another contagion, a more effective one” (!!). The humanoid spoke in perfect Russian in a normal human voice. His behavior was quite, but he never let the woman come close to him and began walking away towards the opposite plot of land near the river. The woman followed him and screamed bitterly, “Why is that, why?” She then heard a voice from afar, “It must be done in that matter”. The encounter lasted for about 2-3 minutes. In the morning decided that maybe the incident had been a dream and also failed to find any traces in the flowerbed, and her husband slept throughout the whole episode. However the investigator (Kazakov) found several trees that had been broken and dried up in what appeared to have been a typical UFO “landing site”. NOTE:The above image is a rendering. Long ago it became clear that the Soviet Empire had begun to crumble long before the bizarre and indeed incredible article in the Soviet daily, Tass on Monday October 10 1989 detailing an account which shocked many in the west due to its bizarre nature, of course that was the report of an alleged landing of a UFO in a park in the Soviet city of Voronezh and even stranger still the fact that unusual looking humanoids exited the craft and apparently interacted with several local children which were apparently the main witnesses of the event. Later research by Russian researchers Genrih Silanov, Fyedor Kiselyov, Yuriy Lozotsev and Alexander Mosolov proved that there had been dozens of other close encounters and incidents in an around Voronezh starting in August through January 1990, the results were published in a book appropriately called “UFOs in Voronezh” published in 1990. Before these events both leaders, Reagan, and Gorbachev spoke about the possibility of an alien invasion of earth and pointed out that if that happened all the nations of the earth would unite and do away with their petty political and geographical differences. Already in the spring of 1989 Hungary had begun to dismantle its fortified border with Austria, a clear signal that the division of postwar Europe was coming to an end. And before the astounded eyes of the world by the end of the year, on December 22 1989 to be exact the Brandenburg Gate in East Berlin is opened. 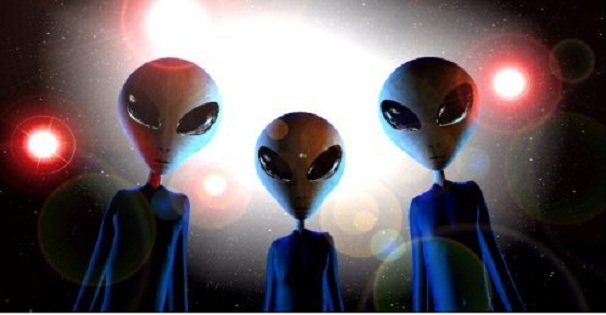 After the unprecedented wave of close encounters with humanoids and UFOs during the decade of the 70’s, 1980 signaled a clear slowdown of reports or encounters, they had not completely gone away but there seemed to be less interest and hence less reports of UFOs and their occupants. This trend appeared to last until the end of 1988 and the beginning of 1989 when reports of humanoid encounters exploded, but in undoubtedly unexpected locations, mostly the whole territory of the former Soviet Union and Eastern Europe. 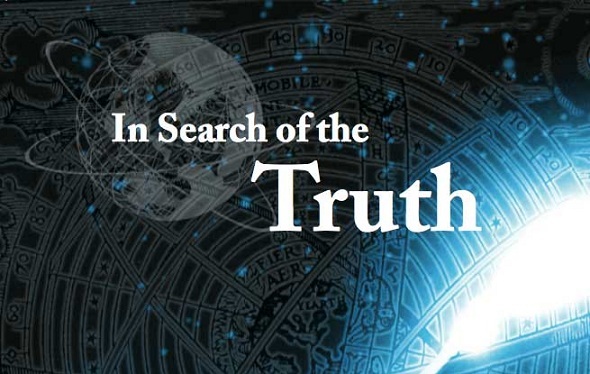 In my files alone I have over 500 high strangeness and humanoid encounters for 1989, more than half from the former Soviet Union, and for 1990 I have over 600 reports, again more than half from the former Soviet Union. 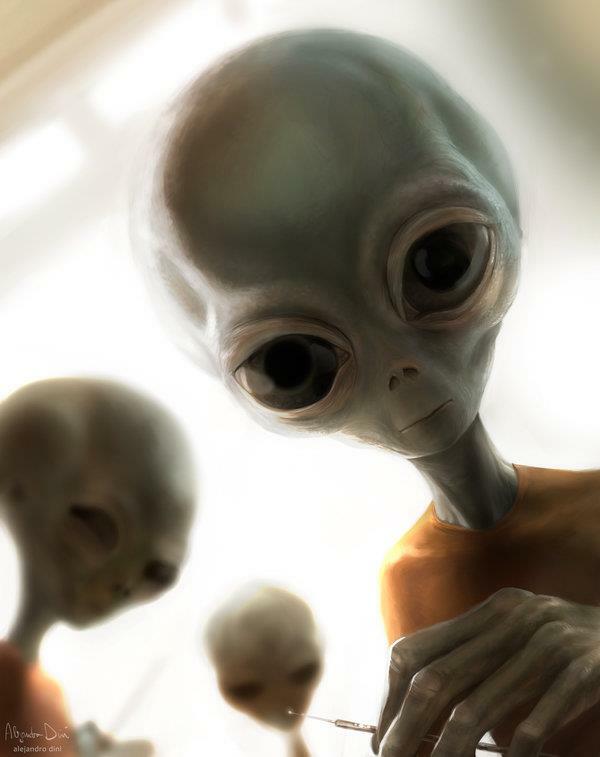 As the wall crumbled interest in UFOs and aliens appeared to increase on a daily basis in this vast territory of hundreds of ethnicities with many accounts of bizarre encounters being published by local government controlled newspapers and other cases published by private researchers in their Samizdat newsletters. The wave of encounters, of all types, began in the former Soviet Union at the end of 1988 and lasted well into late 1997. NOTE: The above image is a rendering. It was fall of 2008 between 9-9:30pm, I was coming home driving down road A going west when I stopped at the stop light. I turned right onto road B going north, my house was only about a quarter mile down the road on the right so I wasn’t going really fast, maybe 30mph. I am a very observant person so I’m always looking around, when I noticed it on my left. It came out of the sky at a 30 to45 degree angle. It was nearing end of dusk where the sky gets that medium grey colored, I don’t remember if there was clouds, but I don’t think there was, but is still light enough to see a dark shaped outline on it. 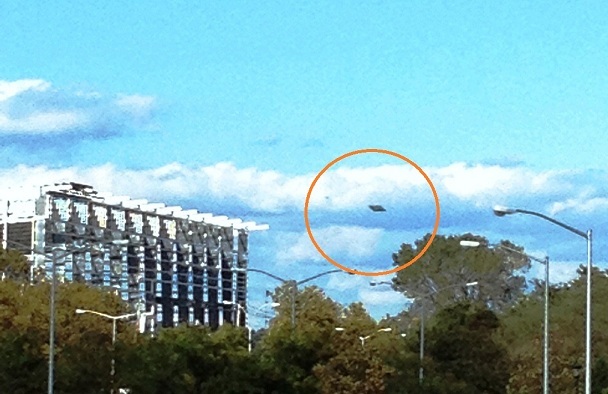 It was a cigar shaped object that was flying vertical. It was moving from north going south, maybe a football field away. It was close enough that if you held out your pointer finger in front of you it was about the same length and width. Once it came out of the sky at that angle it stopped for a brief second and turned horizontal and continue to move south. I’m not sure if it turned clockwise or counter clockwise. When it first came out of the sky it was moving fairly quick, then stopped turned horizontally and began slowly flying over houses moving south. There was some lights on this object, I’m not sure how many but they where all the same color and brightness like a car headlight in the distance, but they didn’t seem to protrude at all, they where just glowing, possibility a light from the inside that was very bright. I seen it flying next to me in opposite direction I was going until I turned at my neighborhood entrance where I hurried up and turned the block so I could get another view of this object, but by the time I got there it was already gone. Whole experience lasted maybe 10-15 seconds. NOTE: The above image is a rendering. 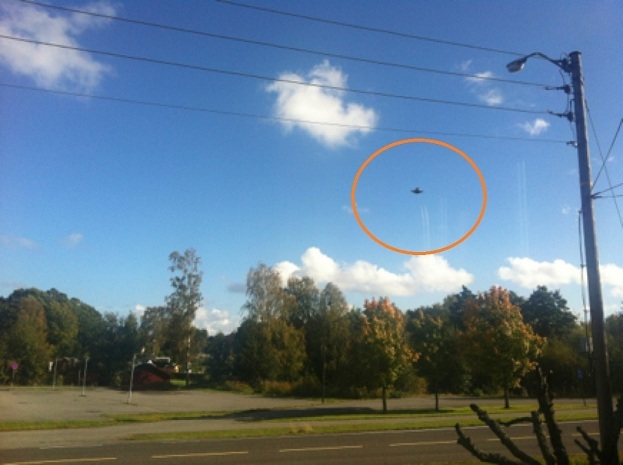 Sighting reported to World UFO Photos and News. Thanks to Ben Garfield. There is no exact date only that it occurred in the summer of 1989 and again the witness was military personnel in this case a submarine officer: Location. Far East, Russia Date: Summer 1989 Time: daytime. A Soviet Naval Submarine officer, D.A. had gone on a hunting expedition into the taiga and ascended to the top of a hill when they noticed something resembling a rolled up waterproof canvas-tent. Having forgotten their own at home they helped themselves to this seemingly abandoned tent. They prepared to spend the night there near a bonfire. Soon they noticed a strange cloud that hovered over them for a long time. The cloud was very low, just below head level, & perpendicular to the ground. D.A. struck the “cloud” with his fist and felt a strong repellent force. Then, taking a running jump he flew shoulder first into the cloud. After flying through the cloud the witness found himself in an unknown location. While on the hill it had been evening and cold, the place where he was now was covered with bright sunshine and hot, he also felt hot sand under his feet. Instead of bushes he saw trees resembling palms. He could not see a river anywhere but saw what appeared to be a large ocean. He was apparently standing close to the seashore. Soon D.A. saw an “amazing car” approach his location, he had never seen such a similar vehicle before. There were 3 persons in the vehicle, a man and two women. They greeted the witness in perfect Russian and invited him for a short drive. He agreed, feeling no fear just curiosity. Soon they arrived at what appeared to be a kind of “laboratory.” When they entered the lab the strangers called him over “Hey military man” (he was wearing a military shirt) and kindly asked him to take some “tests”, which he agreed to do. He was asked many different questions which D.A. patiently answered. He then dared to ask the strangers who they were. He was told that they hailed from the 21st century (what year?) and added that if he wanted he could stay with them. D.A. refused mentioning his wife, family and children. “Well, many people disappear (! )”, said the strangers and soon brought him back into the very same blanket-like cloud that hovered close to the ground at the same location. There D.A. asked another question, “Here we have many troubles, changes, “Perestroika” etc”, what will happen?” The stranger then assured him that everything would be fine. He passed through the cloud without any hindrance and appeared in the same hill. His friend met him in a very excited state, screaming, “Where have you been? Didn’t you hear me calling you?” He was obviously very irate. They then both sat near the fire and talked about what had occurred. Suddenly a wave of fear swept over the men, and both gazed towards the bushes. They believed that the origin of the fear was located within those bushes. D.A.’s friend took out his rifle and yelled to whomever he thought was hiding behind the bushes, threatening to shoot him or it. Nothing was heard in response. He shot into the bushes and the fear suddenly dissipated. NOTE: The above image is a rendering. October 25th 9:55 pm. We were trying to take photos of Jupiter on our tripod with the self timer so there would be no shake. The first photo looked like there was a greyish bar beside the planet. I thought that perhaps my camera lense had a scratch on it so I took another photo and noticed the greyish bar was still there but had moved lower in the sky. We brought the camera inside so we could get it on the computer and zoom in. When we zoomed in we saw 2 copper bars connected by different coloured lights. Tried to get more photos after that but it was gone. I could not see the object with the naked eye. Only in the photo. You’ll notice in the photo that the “bar” has moved downwards between photos. All the stars are in the same place. We have a lot of Fireball Orb activity in the area over Lake Ontario. We seem them at least once a month. KEN PFEIFER WORLD UFO PHOTOS ………. Thanks to MUFON CMS system. We observed a greenish light appear near the waterline. It lasted for a second or more then went out. It repeated again, and again, as though someone with a flashlight (military, green filter) was walking down the beach in our direction while staying out of the breaking waves water line. We thought, until the light approached our relative position, near enough to see no one shining a flashlight, just the geenish, circle of light. I quickly assumed, and said: “its probably a really large firefly” and left the group on the sand dunes, to see for myself. Timing my approach to the lights on/off sequence,(about 5 human strides per flash), I was able to peer into the light moving south (circular, 3 feet in diameter, bright, greenish-yellow light) and observed nothing more than a brightly lit, visible moving waterline, sand, sea shell fragments. Incredulously I marveled aloud while looking skyward for its source, a beam, a sound? “Can you guys see a beam?” “No” came an answer followed by “Get into the light!” “No!” I replied while following along (striding) for 2 or 3 more southward flashes before peeling off and going back to our sand dune perch. 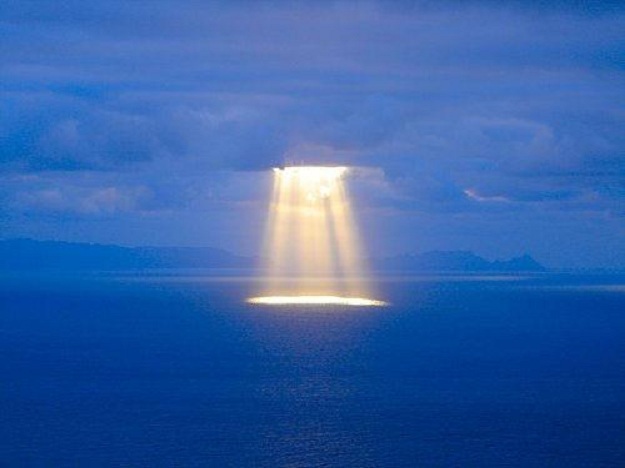 The soundless, beamless light was watched for as long as it could be seen, going down the beach, southward, seemingly staying just out of the Atlantic Ocean. NOTE: The above image is a rendering. 2007…. FIRST ABDUCTION AT 3 YEARS OLD. For my daughters abductions its hard to give exact dates. She goes all the time according to her. When she first spoke of being taken from her bed at night she was 3. Which I would say it was around the summer time of 2007. (She was three then and turning four on Halloween). So I am not sure how to give you around about dates for all her abductions. I just started communicating with her more on her abductions cause she is at the age now where she likes to talk about them and share her stories. She seems more aware now of what is happening and going on. She claims to go more in the summer time but goes monthly to her alien school. She is to help teach their breed how we play and learn. I have some images she has drawn I can share with you as well. Her first adventure she claimed they took her from her bed, but not her whole body. She described it as her inside self was outside her body and she could look down at herself. She was never scared or feared what was happening. She went with grey like aliens that are short. She claims her first abduction they took her to the alien station (as i call it) and there they operated on her right eye. (which before this story was told to me she always complained of her right eye hurting, but eye vision was always checked out to be perfect). She claims they changed her eye to be able to scan it when she goes to with them to be able to identify her and to enter the alien station. She claims she was taken on a tour of the place and shown where all the babies are kept in tube like water balloons (as she described). Hanging from like the ceiling area in thousands. That the babies were of human and alien genes. She also was explained the reason she was there and it was to teach their babies of mixed breed how to play and learn as humans do. She said they told her that they were not here to harm her in anyway or us here on Earth but to also help us with ourselves to evolve and learn. This amazed me coming from a 3 yr old mouth, someone who has never sat down in front of a TV of any kind and even heard of alien abductions. She and I were sitting in her room at her little table playing when she brought up the story of her alien friends. So since then she tells me stories off and on of abductions. Just not too long ago, maybe a month or so I was awaken from my sleep with a room full of bright light and seen a small short greyish figure pass beside my dresser and walked out through my wall. As he was doing so he communicated to me telepath, everything is ok go back to sleep and without realizing I must have fallen right back to sleep. Was the next morning when I remembered seeing him and I asked Seanna (my daughter) was she abducted that night and she said yes. Then is when I asked could you draw me some images of the things you see or experience. So I get stories from her all the time so not sure how you want me to give dates on her abductions or if you just want to use the first experience. She can tell you some things that make me want to sit down and listen for hours. While on their planet, she has a dome type mask over her head (I would assume she is meaning something like the astronauts wear in space) At the top of the dome it has a pipe like material that connects to the top of a rail type system that is connected on the ceiling that when she walks it follows her through the (shall we say) craft or housing she is in. This provides her with her type oxygen that she breaths here on earth. She explains that others are from different planets and they get different type of oxygen to breath (or what they need on their planet to breathe). Now she does get to take this off only ONCE while she is in their housing and that is when she goes to the playground to play with their breeds. She said she has to step into like a walk-in closet size area with two doors which close tightly and she removes her dome breathing mask and then has to move quickly out the other door into a dome type playground area. Her she teaches the kids how they play on playgrounds. In this area the alien breeds are breathing in our oxygen that we have on earth and adapting to it. As they are human and alien breeds as she claims. (* Hope that made sense, tried to explain it the best I could).I will get images together of the few things she has drawn up and send them your way and describe them as she has done to me. Glad to know others out here are believers. Daughter name is Seanna Barkley and she was born 2003 on Halloween !! Her birth was predicted by my sister, lol….my family of weird and unexplained. NOTE: The above image is a rendering. KEN PFEIFER WORLD UFO PHOTOS …… Special thanks to Tracy Barkley [ Seanna’s mother ] for this increadible abduction encounter. It takes courage to speak the truth. On December 24, 2011, I was driving south on Hwy 36 from Boulder, when I looked left and spotted an object in the sky heading west. Object was black cigar-shaped with a white vapor ring around it. 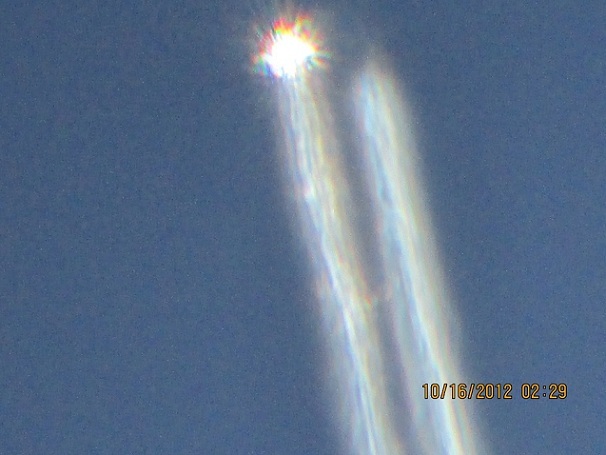 The vapor had a short tail trailing behind which evaporated very quickly unlike a jets vapor trail. Object appeared to be about 10-12,000 ft. in the air. Its speed was like that of an aircraft on approach to an airport but it maintained a level course and never descended. 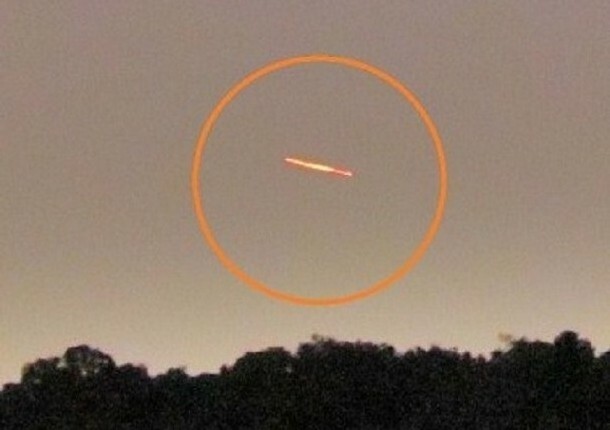 Thought the object might be an asteroid or meteor. No brightness, flames or debris being emitted. There was a bright blue sky with no clouds anywhere and no other aircraft were in the vicinity. Checked the time on the car clock at 10:50am. Exited onto McCaslin Blvd. heading west and continued to observe the object which gradually turned southwest. Could still see object moving away in the distance as I turned south. Lost sight of it shortly after driving among houses in the subdivision. Had feelings of amazement and puzzlement at what this was. First reported it that same evening as a meteor on the American Meteor Society website. A few days later received an email from Tokyo that my description could not be a meteor. Only later did I come to the conclusion it might have been a UFO. I am very familiar with many types of aircraft and it was unlike anything I had ever seen. Entered a report on the UFO Evidence website in July. NOTE: The above image is a rendering. KEN PFEIFER WORLD UFO PHOTOS …………. Thanks to MUFON CMS system. Home alone watching a film and my screen just went off and I got up to get the charger and plugged it in. I went on my phone after attempts to google the problem. When my phone was being unreponsive and the screen was flashing, I looked up at the window and there it was. At first I thought it was the black helicopter circling around the estate but it was silent and then I realized what it was and then I thought I need to get a pictuure of it. I tried the slide to unlock the camera but the camera screen kept going off. I managed to budge it but my hands wear numb from shock and then I got it to just unlock and took the picture. I felt like the air was heaving on me as I stared at it and I felt numb and weak but I just stood there like I needed to realize what was happening. I noticed it had been moving upwards from the distance of the tree edge, and it just suddenly swooped up like it was a elevator shaft going up a inisible tube. After that I had the worlds biggest head ache. 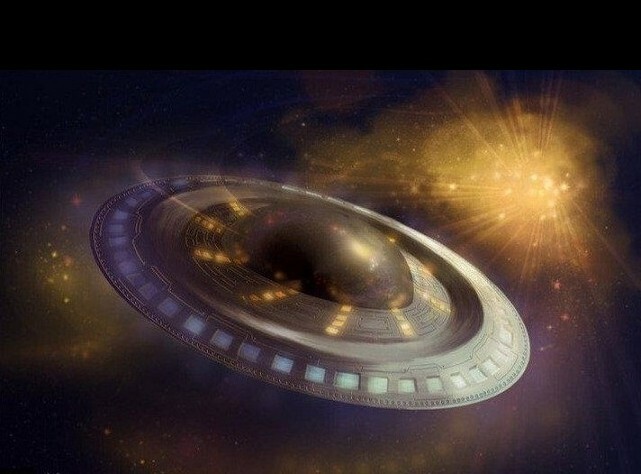 KEN PFEIFER WORLD UFO PHOTOS ………… Thanks to MUFONCMS system. My father was driving into the entrance of the “Toys R Us” toy store to simply buy a gift for my younger brother when I suddenly noticed something fly up from the roof of the store! My first thought was that it was a frisbee but I had read numerous books on U.F.Os and this clearly seemed to be the classic shape of a flying saucer with a short dome on its top! I thought it was too good to be true, but I told my dad to park quickly. As soon as he had, I opened the door and jumped out just in time to see it fly slowly and silently over my head! It was lower than it was when I saw it from the car. Now it was about 25 feet from the ground and it still was descending! It was 23 feet from the ground and I thought it was going to land when it began its ascent. I was running right behind it and pointing excitedly when my older brother exclaimed that he too saw it. My parents and my younger brother never saw it though. I was still following it when a car drove in front of me and cut off my vision. I ran around the car as fast as I could ,but when it got out of my path I only saw it for a fraction of a second before it descended about three feet and disappeared behind a building. I stared at the place where it had flown for a few moments, then turned back to my family and asked if they had seen what I had. To my dismay only my brother had spotted it. I was very excited the rest of our visit and kept looking for anything unusual in the sky but I did not see anything like that for the rest of the day or any time after. NOTE: The above image is a rendering. KEN PFEIFER WORLD UFO PHOTOS ……. Thanks to MUFON CMS system. I was taking a break in the garden at nursing home were I am a nurse. Just looking up enjoying cool evening when it came into view. I know it wasn’t normal air traffic from DIA. You don’t believe it when something like this craft comes into view. I am VERY familier with military and general avaition type planes. This was unique ! Flat black. maybe 7 small red lights in random pattern on bottom surface. Its wing span was two to three times the wingspan of the airliners coming over at the same altitude. The effect was like the movie Preditor when the creature came out of the water and its cloaking wasn’t working properly. Not the electrical effect on the surface but just the mottled effect of a melfunctioning pattern matching effect. Was not a Stealth Bomber ! Full Triangle. Its motion was smooth, silent and linear. Sighting lasted for maybe less than one minute. I just happened to be looking in the right place at the time. I had to smile to myself as I took it to be “ours” and was surprised at the technology involved. Definitly leading edge stuff whoever owned the technology :) Basicaly it appeared to either go into more cloud or the cloaking effect switched back on. I had cell phone in my hand but stood there like a dummy not wanting to look away. NOTE: The above image is a rendering. KEN PFEIFER WORLD UFO PHOTOS ………….. Thanks to MUFOM CMS system. 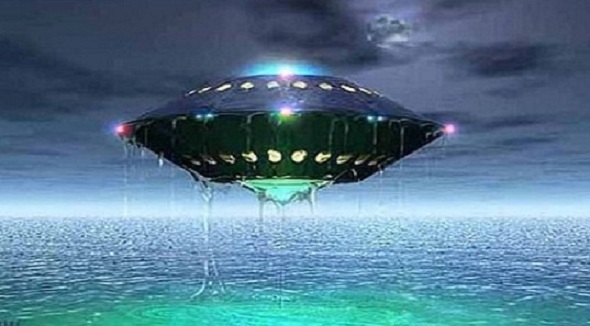 We were at Oak Island on the beach fishing when my wife actually noticed them first, when she saw them she immediately pointed, asked me what it was and I turned to see, in the southwestern sky, at about 2 oclock in position, there were two bright red lights. One was very large, oval in nature, dare I even say saucer-isk in shape. The other was tiny and round. The larger one would make maybe 20 to 30 of the smaller ones in size and was stationary but the smaller one was to the left of the larger, moving down and to the left, it then circled back up and to the right, back towards the large object. Once it reached the big one they appeared to merge and then the large one just dimmed out really fast as if someone turned off a switch. As it was over the ocean horizon I couldn’t swagger an estimation of how far away they were. There was no sound and the entire event maybe lasted 15-20 seconds from the time I turned around. This was at 9:20pm on the night of Sept. 19. We didn’t have a camera with us as it was night and we didnt think we would need one. We were both awestruck as we have never seen anything like this before and have no idea what they could have been. If it was a manmade aircraft I have no idea what kind it could have been as these did not act as a typical aircraft would. NOTE: The above image is a rendering. 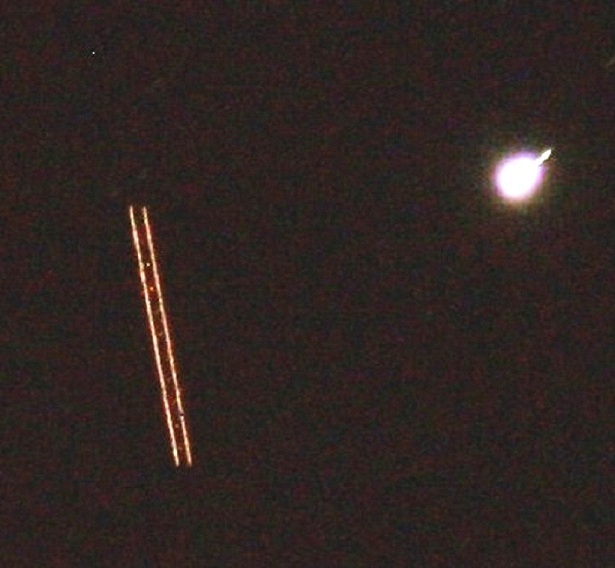 KEN PFEIFER WORLD UFO PHOTOS ……… Thanks to MUFON CMS system. In the early morning of Oct 5, 2012, around 6:40, I woke up and went outside to have a smoke. 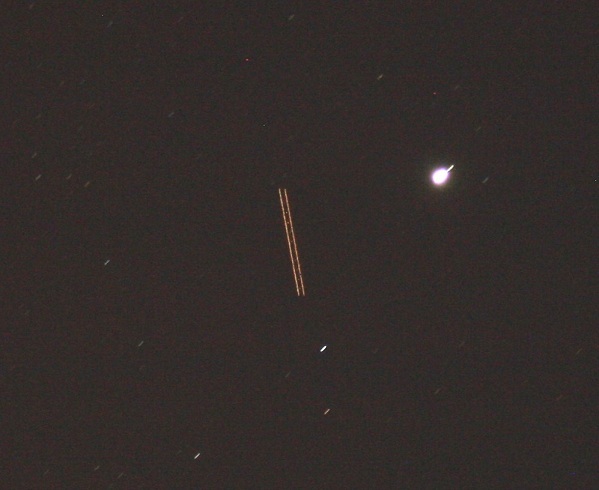 Being an amateur photographer and a UFO enthusiast, I grabbed my camera before going out as I do every time. I immediately looked for the moon just to observe it, and looked away for about a minute. When I looked back up, I noticed a white dot that was not there before, in addition to a growing mass of clouds all around it. I wasnt sure yet if it were moving and couldnt decide if I should try to get a picture or just witness it. My next thought was that I needed a witness because it did appear to be hovering. I ran inside and woke up my spouse frantically telling him to come outside. He jumped out of bed and ran outside, not even taking time to dress, and stood there for about 2 more minutes and observed it with me. I was working my camera trying to find the object while zooming in, snapping several pictures, all time-stamped at 6:45 am. However, at this time, the object noticeably began to move in an upward direction, then made a right turn towards the direction of the moon. We then watched as it slowly disappeared, but cloud cover remained. Admittedly, there were naturally made clouds in the sky, but what was in the spot of the object and now covering the moon, seemed thinner and not as stable. Meaning, they dissipated rapidly compared to the others in the area. Within 2 minutes of the object disappearing, an almost perfect square-shaped area of the sky (including the moon) became perfectly clear, almost like the clouds were just wiped away. I took pictures of the sky before during and after all of this, to show exactly how clear it became. I as certain about the next statement as I have ever been about anything in my life and that is this; I felt absolutely sure that I would need my camera that morning, and that at different times throughout that day and every since, I have felt a presence. 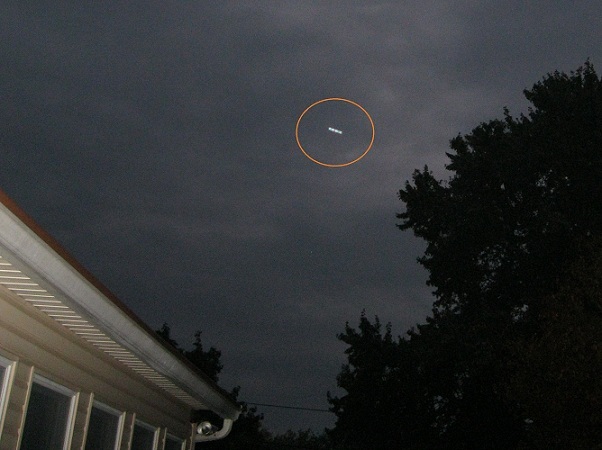 KEN PFEIFER WORLD UFO PHOTOS …………… Thanks to MUFON CMS system. My neighbors small daughter noticed a very bright star that shown in the middle of the day, that didn’t move, and brought it to my attention. The sky was clear, free of clouds, and blue. Visibility was unlimited. The temperature was in the upper 60s. I had 4 visitors at the time and they all called to me to come out and look up at something strange. I got binoculars and was stunned to see a bright object that looked cylindrical, with two bright white fluorescent tubes on its sides, hanging very high in the sky. I have an 8″ Meade SCT telescope and observed it at about 150 power and it was extremely clear, unmoving, or barely moving, hanging very high in the atmosphere. It was so high, it didn’t appear to have shape except through binoculars. It moved ever so slightly that I used the telescopes controls to keep it centered, but it never moved more than 10 degrees from the original position in an hour and a half. I used my Canon digital camera and took about 50 photos of the object through the telescope and then shot some video also. It oscillated between dim to very bright, (sunlike), on a frequency that varied but was of about 30 seconds. If it was a balloon it would have drifted with the prevailing winds, if it was a satellite, it would have moved west to east in its orbit, and been out of sight in about 10 minutes, if it was a plane it could not stay up without moving that long. A helicopter would have run out of gas and could not have hovered that long. None of those things fit this description. 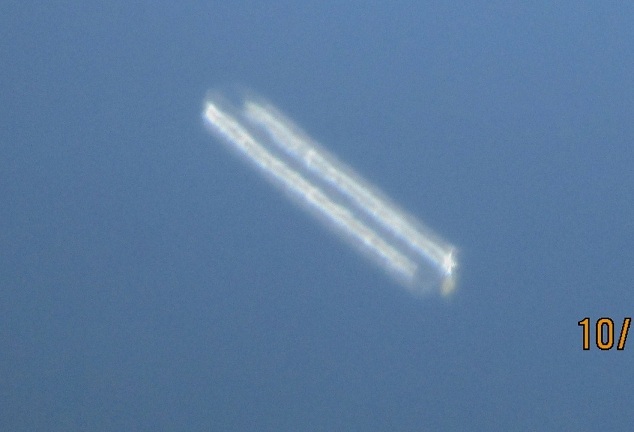 It appeared to be cylindrical in shape, semi transparent, and had two very bright lines of light, vertically on its outside edges. Being an amateur astronomer, I know my planets and heavenly bodies and it was none of those. After about 2 hours of observing it through my telescope I came in to post my photos on facebook and during that time my wife came in and said it had disappeared. I am experienced with taking pictures through my telescope and I know about reflections, planets looking like ufos and such. This wasnt even close to any of those events, and I have 5 other witnesses to prove it. They all saw it through my telescope and observed it for over an hour.. I was at my house and I went to take my dogs out when I saw a strange orange orb in the sky to the south of my house. I noticed that it disappeared and after a couple of minutes it reappeared. At first I thought it was a street light then I remembered there was no street light in that location. The orb was directly in between to street lights and higher in the sky than the street lights. I went and got my camera and started recording it. The object would disappear and reappear. This went on for about an hour. I also noticed smaller orange orbs going up to and some would go up to it and then away from it. I wondered what it was doing and if it might come closer to me. After about an hour the orb disappeared and did not reappear. I watched to sky for a while longer to see if it would reappear and it didn’t. I watched to sky every time I went out that night to see if it would come back and it didn’t. In the summer of 1968 at the age of 10 we lived in a rural area of Lakeland Florida. My mother and I were walking home from a neighbors house when an metalic disc shaped object came up on our right from the nearby wooded area at the end of our road. Before it got to us I noticed a dome shape on top it was moving very slow with no sound what so ever. as it got overhead it stopped we both looked up and saw a lighted circular bottom where lights rotated with different colors. As it hovered a yellowish, orange light shined down on me and my mother. It remained overhead for what seemed like an eternity, It was proably only a few minutes. It was approximatly 30 to 40 feet in diameter and it had no down blast or heat, and the only sound it made was a low rhythmic oscillating hum like Wha,wha,wha,wha,etc. It was just a few feet higher that the telephone pole that was within 20 feet of us. As my mother and I regained our composure, she screamed for my brother to come see the object. When she did the light went out and the object took off to our left in a blink of an eye. It had disappeared. Ever since that day I have looked up to the sky to see another one but I have never had another encounter. NOTE: The above image is a rendering. Here is what happened, normally I am not home during on weekdays during working hours, however my childcare (nanny) was sick and I didn’t have a back-up. Anyway, we went to the boardwalk so I can run a few miles and my daughter loves being pushed in her running stroller… sorry Anyhoo, I was deciding which way I would run first, I enter the Staten Island Boardwalk on Seaview Avenue and Father Capodanno. I turned toward the east and all of a sudden from nothing to a flying object that looked like a STINGRAY it moved like a stingray, it was the same color as a stingray. To me, it appeared to have like a light green and pale pink energy around it and it also appeared DISTRESSED. It was barely moving and I watched it until it vanished. It didn’t fly away fast it just became invisible, or I want to say transparent with the clouds. As I mentioned it appeared distressed, and I am not the only one who thought that because the police helicopters were searching, several helicopters for a very long time. I thought I saw it again over the Verrazano bridge, but again in a second it was transparent again. I could see the energy around this thing and it was amazing. Also, as you will be able to see in the photo, there was NO plane pulling it!!!! Many UFO researchers working on their research in the 1970s and 1980s died under mysterious circumstances, and may have been killed. This is the conclusion reached by an amateur astronomer, a former U.S. government adviser Timothy Hood. He made this statement at an international conference in Amsterdam dedicated to search for extraterrestrial intelligence. Famous American astronomer Morris K. Jessup, whose books about intelligent life beyond Earth have become bestsellers, committed suicide. He ended his life by opening an exhaust pipe in his car, locking his door and turning on the ignition. Professor James Edward McDonald, who for many years served as head of the Institute of Atmospheric Physics of the Earth and studied unidentified aerospace objects, put a bullet in his head. In January of 1987, another scientist, Avtar Singh-Guide, went missing. He was later declared dead. In February of 1987, Peter Pippel was run over by his car in his garage. In March of 1987, David Sands committed suicide by crashing his car into a building. In April of 1987, four developers of space programs died. Mark Wiesner hung himself, Stuart Gooding fell victim of murder, David Greenhalgh fell off the bridge, and Shani Warren drowned. In May of that year, Michael Baker was killed in a car accident. 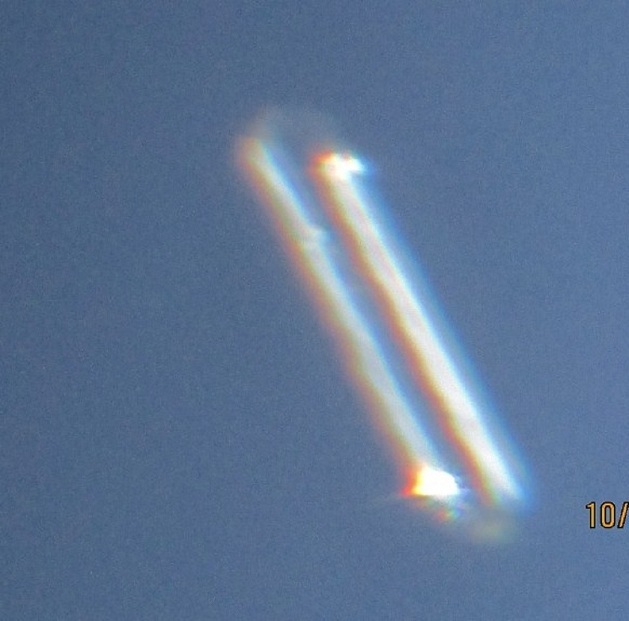 KEN PFEIFER WORLD UFO PHOTOS.ORG …..Special thanks to UFO Casebook and Margarita Troitsina. Certified by the following NICAP Board members: Reverend Albert Bailer, Dr. Earl Douglass, Mr. Frank Edwards, Colonel R. B. Emerson, Professor Charles A. Maney, and Rear Admiral H. B. Knowles. “It was a night in ’51. Under lowering clouds, a United States task force of fourteen ships was cruising near Korea. Down in the Combat Information Center of a CVE-class carrier, intercept officers and radar men were keeping a routine watch. Suddenly a strange blip appeared on the CIC radarscopes. Some unknown machine, larger than carrier aircraft, was circling the fleet. In minutes, Navy interceptors were boring up into the clouds that hid the intruder. At first, the CIC men had thought it was some new Red aircraft spotting the fleet by radar. But an hour passed with neither an attack nor message to bring enemy bombers. Even before this the CIC men knew, from the object’s speed and maneuvers, it had to be a UFO. As the hours went on, fresh pilots replaced the first group. Again and again, flying by instruments in the misty dark, they risked collision for a look at the unknown craft. But the UFO stayed deep in the clouds. Down in the CIC, puzzled intercept men watched the mysterious “target.” What could explain the hours of circling up in the overcast? Could “they” see through those tight-packed clouds by some unknown device—or a different kind of vision? What was behind this long surveillance—curiosity, or something more ominous? Near the end of the seventh hour, another squadron was launched. Abruptly, the UFO stopped circling. As the tense CIC men watched, it swung in behind the nearest Navy plane. “Target joining up on wingman!” the lead pilot reported. “Close in for visual on target!” ordered the CIC, fearing an attack on the wingman. Though the clouds made it almost hopeless, the leading pilot turned. Swiftly, the UFO speeded up, leaving the plane behind. In less than ten minutes, the radarscopes showed it was two hundred miles away. The signed report later certified by Board members was given to NICAP by one of the pilots involved, now a lieutenant commander on duty in this country. 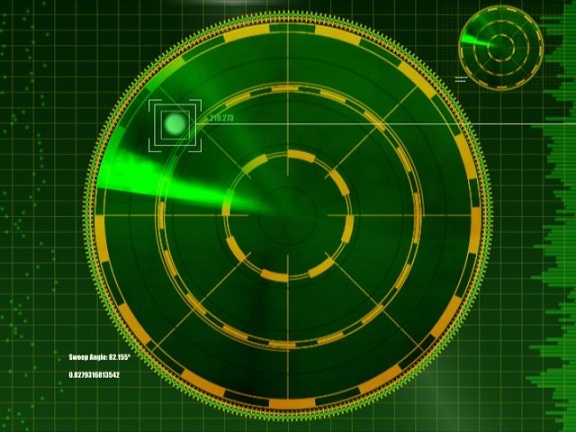 The unknown machine, officially logged as a UFO, was tracked by radar operators on all fourteen ships. Its long surveillance of the task force remained a mystery. On 10/5/2012 I was in my back yard taking photos (between 5:30 and 5:50 am). I belong to a paranormal society and was taking photos of orbs. I started to take some shots to the north of my house, when I noticed the light anomaly. I knew it was very different from any of the lights that I have seen during an investagation but I still thought that the light was something paranormal. 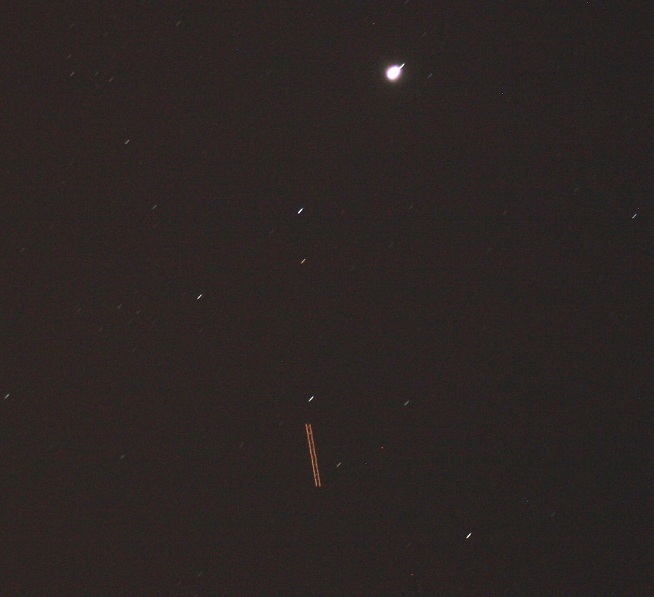 I took about 9 photos of a bright cigar shaped object that was moving in the sky (in the north). The light moved in different direction and it pulsated as it moved. There was no sound. I down loaded the files on to my computer and when I enlarged the photos you could see that the object was made up, of what looked like circles (or rings)connected to each other in a single row which was illuminated by the bright light. I was very excited thinking, that I have just taken a photo of a different type of light energy. I called my sister who is the co-founder of our group. When she saw it she said the word UFO. So that is when I got into contact with MUFON. 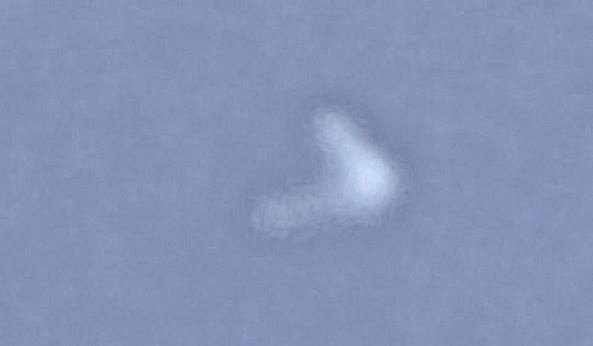 I know that if any one could found out just what this is its MUFON. I followed the object until it went down behind the trees in the distance and caught the last shot of it, as it came back up over the roof line of my house. KEN PFEIFER WORLD UFO PHOTOS ………….. 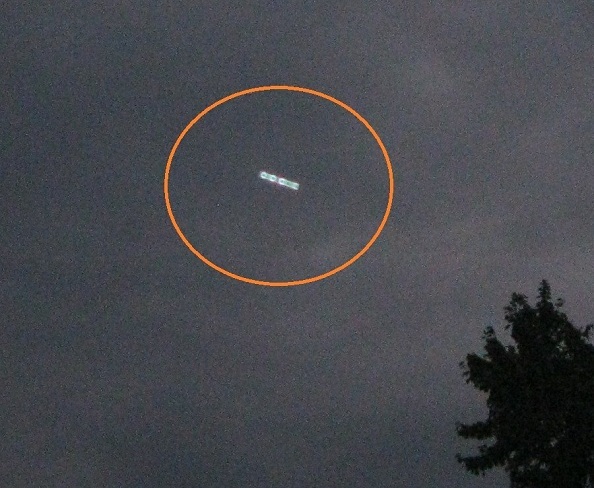 This case is under investigation by MUFON Pennsylvania.